Cycles of Life is the powerful fusion of an autobiographical and contemporary portrait of a child imbued with end of 19th century sensitivity evoking family cycles and cycles in art. 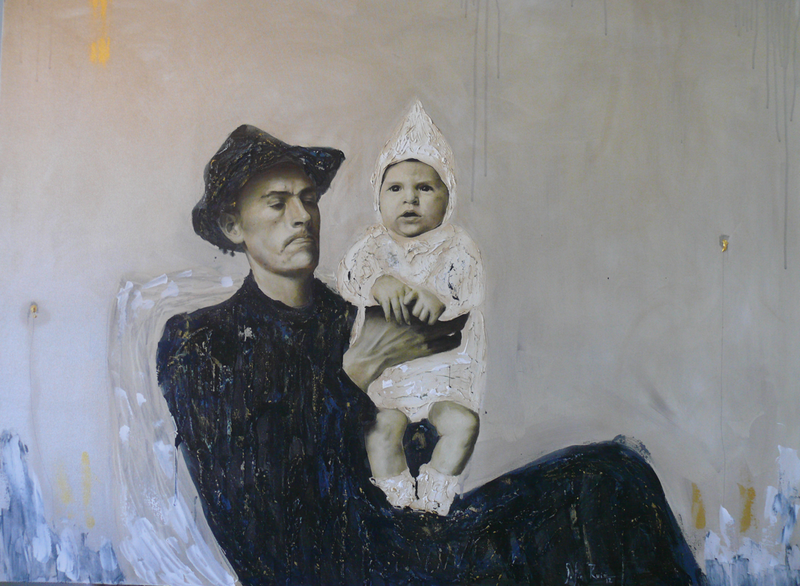 A lack of detailed hands or faces results in an abstract painting, the father figure in particular resembling a painting from the middle of the 20th century. The portrait by James McNeill Whistler of Miss Amy Thomas Brandon, for example, is almost completely abstract, except for the delicate drawing of the baby’s facial features, a style which particularly suits babies and children who are still in the making, developing an identity. Life cycles also surrounds the child with an abstract vocabulary, but instead chooses to make the face of the child and the father photographically accurate. We find ourselves here in different territory, historically we can talk of Freud or of DNA, and personally as the artist pointed out the lack of photographs from her childhood spent with a mother suffering from memory loss. Indeed, the absence of a mother here is striking. We question what this baby is doing, and the only response that we have is the artist herself. Assuming that the baby is Sofia’s, the artist was obliged to develop the next generation in order to create her history of the latest, with herself as a baby, and her father as a young man. The importance of hands in the self-creation process explains why the hands are very detailed. For Sofia, there are no real photos to take; the only photos are to be re-invented. The precision of the hands and faces in a world of chance and vague nebulous forms are an attempt to set an identity and a past which not only resist deletion, but also the uncertainty of our own memories. Each generation is created again, but must be created first of all. Ruiz revisits styles and takes ownership of them. In this painting, a future and a recurrence are visible, the twilight which recalls an extension of classical portrait art. Like Gerhard Richter’s domestic work, Ruiz explores the intertwining of photography and painting, and reminds us that if we are all randomly born into families, our work consists of introducing meaning and creating our destiny, which could appear unpredictable and unnecessary. Forming our entire world is really something very small and fragile. In The Dead Mother by Edvard Munch, the artist also refers to an autobiographical episode as his mother passed away during his childhood. The child’s face in Munch’s painting also faces the spectator directly, pleading, whilst the mother’s face looks away, lost. With Ruiz, the father is dressed in black, like the Grim Reaper, or someone in mourning, and the baby in white, presents a striking contrast. The inverted curve of the father’s moustache and puckered eyebrows appear entrenched on the face of the child, who has already comprehended that the world can be a difficult place. However, whilst contemplating this painting, we are at the same time reminded that within this difficulty, this enquiry, this struggle, the world can also be very beautiful.